Performing regular and periodic maintenance is key to keeping your PC running in tip-top shape. It takes discipline to remember to do it, but fear not, forgetful desk jockeys: You can automate many basic PC maintenance tasks, such as removing temporary files, fixing drive errors, keeping drivers up-to-date, and backing up files. Beyond helping to keep your own PC finely tuned, this can be especially useful for those who are the on-call tech for family and friends. At least basic maintenance can be taken care of without your intervention. If you’re using Windows Vista or later, this one is easy-peasy—no need to do anything. Windows automatically runs the Disk Defragmenter every week if fragmentation is found. However, it would have to be manually scheduled for Windows XP. Disk Cleanup is a Windows utility that can delete many types of temporary files to help free up disk space on the hard drive. 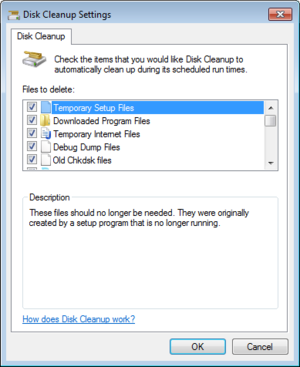 You might schedule Disk Cleanup to run automatically every week or month. 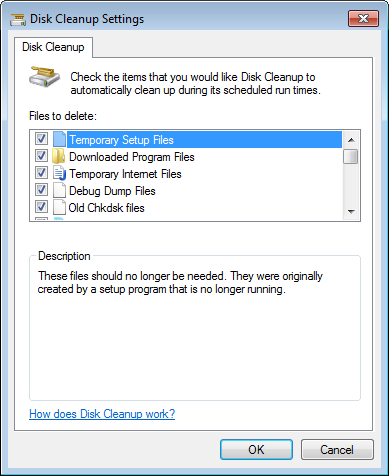 First, you’ll want to specify which items you want Disk Cleanup to delete each time it runs. The best way to do this is to run the utility via the Command Prompt. To open the Command Prompt in Windows 7, click the Start button, type cmd and hit Enter. In Windows 8 and later, open the Start screen, type cmd and open "Command Prompt" from the search results. You can click each item on the Disk Cleanup Settings for a description of what would be deleted. You should see the Disk Cleanup Settings dialog box where you can choose the items you want the utility to clean up automatically. You’ll notice even more options than what you typically see in the menu. (Thanks, Command Prompt!) Once you hit OK the configuration will be saved. Now you can create a Scheduled Task so the Disk Cleanup utility will run automatically using your saved configuration. 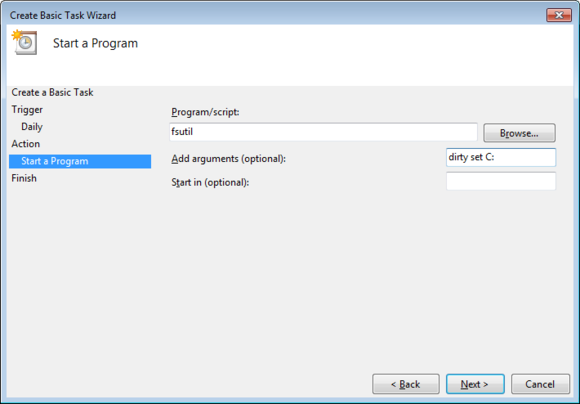 In Windows 7 and prior, click the Start button, type task scheduler, and click on "Task Scheduler." In Windows 8 and later, open the Start screen, type task schedule and open "Schedule Tasks" from the search results. Creating a Scheduled Task to run Disk Cleanup with your preferences. Many PC geeks turn to the legendary CCleaner software to perform similar tasks, such as blowing away temporary files, cleaning the Windows Registry, erasing browser histories, and so on. You'll still need to use the Windows Task Scheduler to automate CCleaner, however. Check Disk is another utility included with Windows, which can check for and repair errors on a hard drive caused by improper shutdowns and other events that cause corruption. When errors are present it can cause many weird issues. Check Disk is one of the maintenance routines I habitually run when cleaning up a computer with strange or intermittent issues. Though Windows is getting smarter about automatically detecting and fixing disk errors without your having to run Check Disk, it still may be good to run every month or two, especially on PCs running older versions of Windows. Creating a Scheduled Task to run Check Disk with your preferences. If your PC uses a drive letter other than C for the system or Windows drive, substitute the correct drive letter for C: in that argument. This Scheduled Task simply marks the drive as “dirty” so Windows will automatically initialize a Check Disk the next time the computer boots. To help ensure it gets done quickly, consider creating another Scheduled Task to reboot the PC automatically once the drive has been marked dirty. Creating a Scheduled Task restart your PC in order to start a Check Disk. Once configured, you’ll want to modify its properties to make sure it doesn't run while the computer is in use. To do this, click the Task Scheduler Library folder and then double-click the Scheduled Task you just created. Select the Conditions tab and check the “Start the task only if the computer is idle for” option and change it to a lengthy duration—possibly an hour. Every hardware component connected to your PC has a piece of software, called a driver, installed to define how it communicates with the PC. Manufacturers usually release driver updates to correct known issues with their hardware or to add new features. So it’s a good idea to keep your PC up-to-date with the latest drivers for all your hardware components. Though Windows can automatically download and install driver updates if you have Windows Update properly configured, it can automatically install only those drivers marked as important and recommended. Optional updates must be manually approved. However, you can use a third-party tool to keep all drivers automatically updated. The free SlimDrivers software is a great tool for this, though you may find premium driver update programs slightly more seamless in use. Backing up your system and personal files is another maintenance task you should consider automating. The System Restore feature of Windows creates regular backups of your system files and is sufficient for most. It’s turned on by default, but you may want to ensure it’s still on and operating correctly. 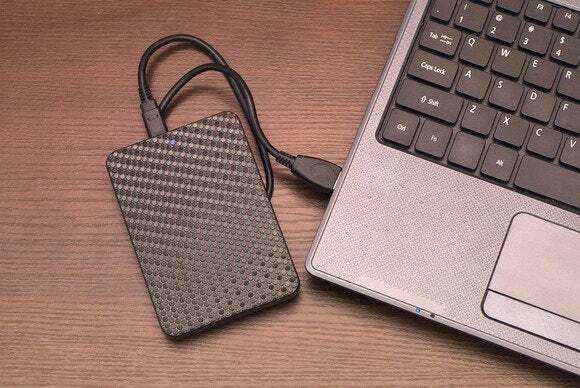 There are endless options and methods for backing up your personal files, which can be organized in two major categories: local backup that saves your data to a separate hard drive, or cloud backup that saves your data online. I recommend cloud backup at least for the most important documents and photos, so they’re safe from physical theft or damage. Check out this PCWorld guide about using SyncBack Free and cloud storage to take the headache out of backing up your PC. 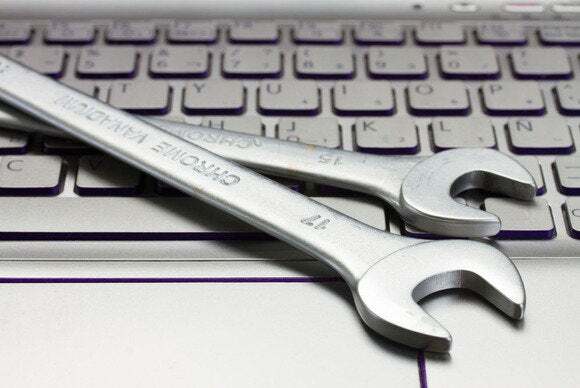 The final PC maintenance task you'll want to automate is one of the most crucial: security. Most premium security suites pack scheduling options that make it a breeze to automate antimalware scans, but the option is more hit-and-miss in free security software. Expert users can configure antivirus software to run at set times using Task Scheduler's more esoteric advanced options, or you can just use AVG Free Antivirus for a headache-free alternative. AVG's protection software includes scheduling options even in the free edition.